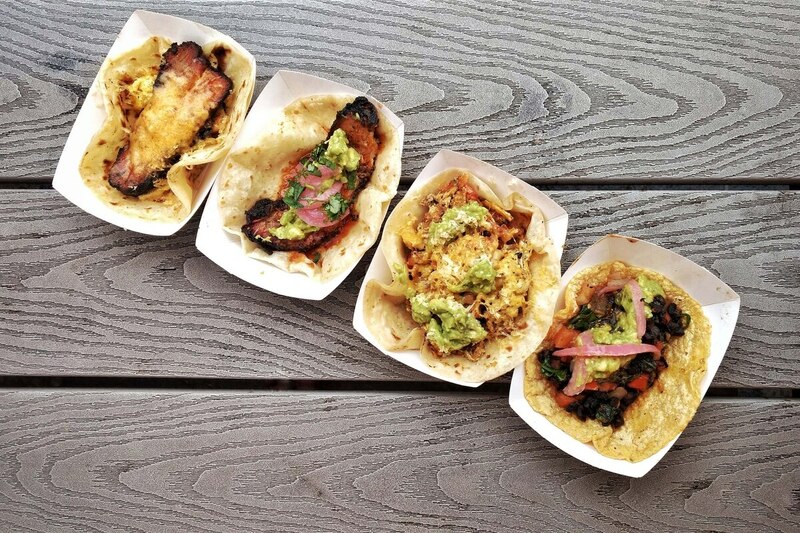 Portland is still a ways from rivaling Austin in terms of grab-and-go breakfast taco choices, but Matt's BBQ Tacos and La Osita represent considerable strides toward closing the gap. Matt's BBQ Tacos. 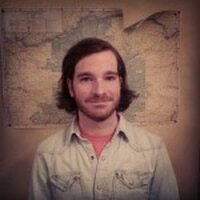 IMAGE: Reid Kille. Spend even a day in Austin, and you're guaranteed to encounter at least one person who won't shut the hell up about breakfast tacos. They measure about halfway between a burrito and a traditional street taco, and their ubiquity in the Texas capital is downright alarming—you can get one everywhere from the dingiest coffee shops and food trucks to opulent Whole Foods locations that peddle them from hot boxes placed en route to the register. It's one of the few major food trends Portland has yet to successfully pilfer from our spiritual sister city, but a pair of recently opened food trucks aim to change that. The newest, Matt's BBQ Tacos, hardly needs an introduction. When breakfast sandwich cart Fried Egg I'm in Love abandoned its post for a brick-and-mortar just blocks up the street, beloved pitmaster Matt Vicedomini took a quick break from opening Eem, the incredible new Thai barbecue restaurant he co-owns in North Portland, to turn the truck into an outpost for BBQ breakfast tacos. The setup is comically perfunctory, with home-printed black-and-white menus below the pickup window and a Texas star above it, which perfectly exemplifies how little else matters when Vicedomini's magical experiments in smoky-sweet protein are the star of the show. In this case, they're crammed into a flour tortilla on a bed of fried potatoes, cheddar and scrambled eggs. The base price is $3.50, and toppings like pork belly, sausage and mushrooms cost an extra $1 each, while brisket is $1.50. The meats contain a burst of smoke and burnt sugar, with an acidic tang in the finish that's been rightfully praised since Matt's BBQ first came to prominence four years ago in a humble cart next to a Northeast MLK Boulevard pawn shop. Our top pick is the brisket, which is packed with Vicedomini's trademark notes of brassy, woody flavors with a melt-in-your-mouth texture and just the perfect amount of char on the edges. The addition of salty eggs and potatoes provides the perfect textural complement to the meats, with the latter being just slightly overdone to maintain composure and prevent leakage out of the tortilla. The sausage, though still delicious, was the greasiest of the three, and best consumed while sitting down. Still, the satisfying snap of its casing is a welcome spin on the mushy breakfast chorizo you'll find at more "authentic" establishments nearby. But if heaps of smoky protein aren't your bag in the early hours, a quick trip to the Numbers provides a very different experience. Located in the parking lot of Plaza 122—a Mercy Corps project that leases space at the corner of Southeast 122nd Avenue and Market Street for less than $100 a month—is La Osita, a delightfully understated Mexican breakfast and coffee cart. Alongside a small selection of breakfast bowls is the brunch taco ($3.50), a small but mighty mix of Tillamook pepperjack, fried egg, colorful veggies and a long slab of applewood bacon that's a good two inches longer than the flour tortilla it's wrapped in. The veggie-forward flavor, complete with bright purple pickled onions and pico de gallo, is a tasty contrast with the fatty flavors of the bacon and the whole egg oozing out of the bottom. If you're looking for something more substantial, consider the Osita burrito (eggs, chorizo, black beans, pico de gallo, pepperjack, sour cream and salsa; $7.75). The total package can be a tad difficult to wrangle while on the run, but this is one of the tidiest such offerings we've eaten in recent memory. La Osita opens at 7:15 am on weekdays and 8:30 am on Saturdays, which means commuters headed to Mount Hood or the Gorge will be delighted to find a relatively quick and easy breakfast option here, as well as a slew of espresso drinks like a Mexican mocha ($4) that's far richer and spicier than what you'd find at most other kiosk coffee stops east of the 205. And we've yet to place an order at La Osita that wasn't delivered to our car in less than 10 minutes. 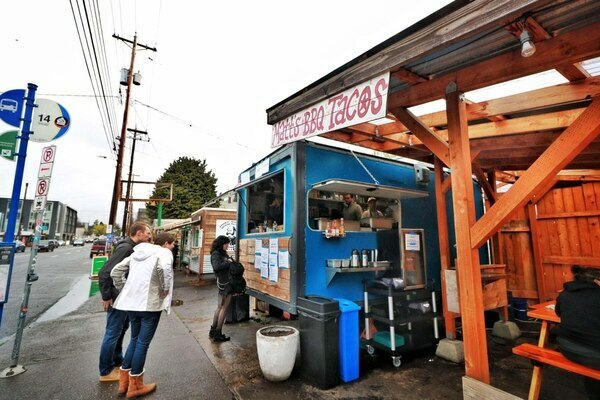 Portland is still a ways from rivaling Austin in terms of grab-and-go breakfast taco choices, but both carts represent considerable strides toward closing the gap. It's unlikely every taco cart in town will want to open at sunrise to cater to hungry commuters in search of brisket-stuffed breakfast bombs. But Matt's and La Osita have done commendable work to put the wheels for the breakfast taco takeover in motion. 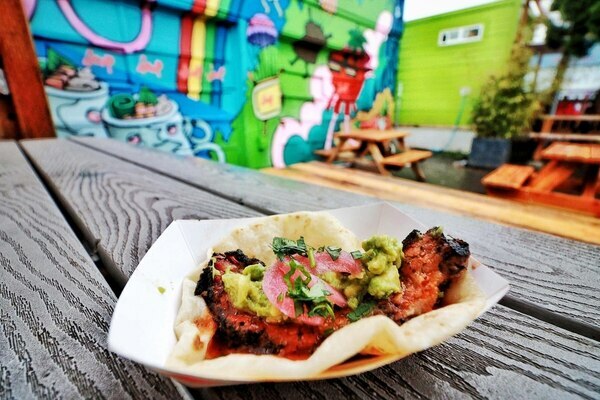 EAT: Matt's BBQ Tacos, 3207 SE Hawthorne Blvd., 503-956-7455. 8 am-7 pm Wednesday-Sunday. La Osita, 1515-A SE 122nd Ave., 503-358-3364. 7:15 am-2 pm Monday-Friday, 8:30 am-2 pm Saturday, 5-8 pm Thursday-Saturday.